Acerola (Malphighia glabra) is a small tree or shrub that grows up to 5 m high in the dry, deciduous forest. It produces an abundance of bright red fruit 1-2 cm in diameter, with several small seeds that look similar to the European cherry. 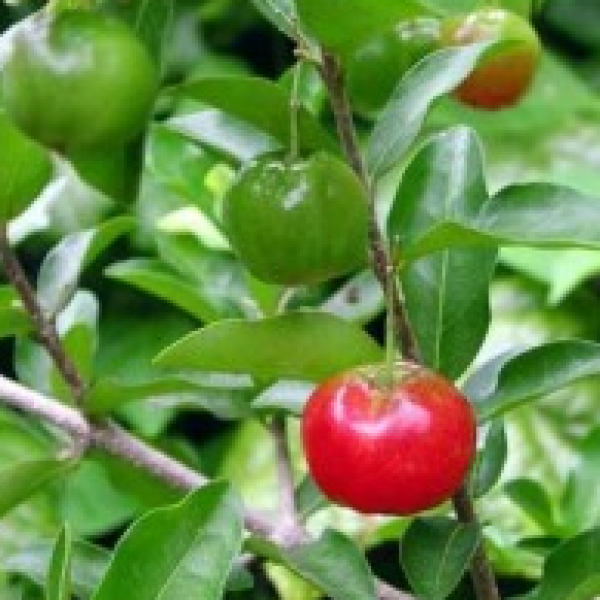 For this reason, acerola is also known as the Antilles, Barbados, Puerto Rican, or West Indian cherry tree. The mature fruits are juicy and soft with a pleasant, tart flavor. Acerola can be found growing wild and under cultivation on the sandy soils throughout northeastern Brazil. It is native to northern South America, Central America, and Jamaica. Its cousin, M. punicifolia, is present as far north as Florida and Texas. Acerola juice is as common and popular in Brazil as orange juice is in North America. As a natural remedy in Brazil, a handful of fresh fruit is eaten for fever and dysentery. It is also used there as an anti-inflammatory, astringent, stimulant for the liver and renal systems, diuretic, and to support heart function as well as to heal wounds. It is employed as a nutritive aid for anemia, diabetes, high cholesterol levels, liver problems, rheumatism, tuberculosis, and during convalescence. In North America, the use of acerola is mostly based on its high content of vitamin C, which has long been thought in conventional and alternative health practices as a powerful antioxidant. Until the plant camu-camu appeared on the scene, acerola was considered the richest known source of natural vitamin C. Oranges provide 500 to 4,000 parts per million (ppm) of vitamin C, or ascorbic acid, whereas acerola has been found in tests to provide ascorbic acid in a range of 16,000 to 172,000 ppm1,2 Acerola can contain up to 4.5% vitamin C, compared to 0.05% in a peeled orange. The vitamin C content of acerola varies depending on ripeness, season, climate, and locality.3 As the fruit begins to ripen, it loses a great deal of its vitamin content; for this reason, most commercially-produced acerola is harvested while still green. Acerola also provides twice as much magnesium, pantothenic acid, and potassium as oranges. It also contains vitamin A (4,300 to 12,500 IU/100 g, compared to approximately 11,000 IU for raw carrots) and thiamine, riboflavin, and niacin in concentrations comparable to those in other fruits. Thus far, 150 other constituents have been identified in acerola.4 In addition to ascorbic acid and the other vitamins mentioned above, acerola contains 3-methyl-3-butenol, dehydroascorbic acid, calcium, dextrose, diketogulonic acid, fructose, furfural, hexadecanoic acid, iron, limonene, l-malic acid, phosphorus, protein, and sucrose. Acerola has not been the subject of much clinical research since it is mainly consumed as a food, rather than used as an herbal remedy. In one in vitro study, the leaves, bark, and fruit of acerola were reported to have antifungal properties. New findings show that acerola may potentiate the benefits and actions of other supplements (the cholesterol-lowering actions of soy and alfalfa, in one study). Recent research in cosmetology indicates that vitamin C is a powerful antioxidant and free radical scavenger for the skin, and acerola extracts are now appearing in skin care products that fight cellular aging. In addition to its vitamin content, acerola contains mineral salts that have shown to aid in the remineralization of tired and stressed skin, and its mucilage and proteins have skin-hydrating properties and promote capillary conditioning. In North America, acerola is used for its high content of vitamin C. Dried acerola fruit extracts can now be found in tablet form and as an ingredient in many over-the-counter multivitamin products in the United States as a natural form of vitamin C.